My wife and I keep reminding ourselves to “assume the best”. And even after 20 years of practice, that assumption is still difficult at times. Why do we seem to gravitate toward gathering evidence for picking a fight rather than forgiveness-before-the-fact? Assume the best possible interpretation of our words. Assume that we may have chosen the wrong words. Assume that we do not want to hurt you on purpose. Assume love, not hate. Assume that as I am filling with empathy, as I am becoming transparent and vulnerable, that as I am opening myself up as a target and handing you the darts … that I trust that you would never even think of throwing them. wow. thank you Jim…. 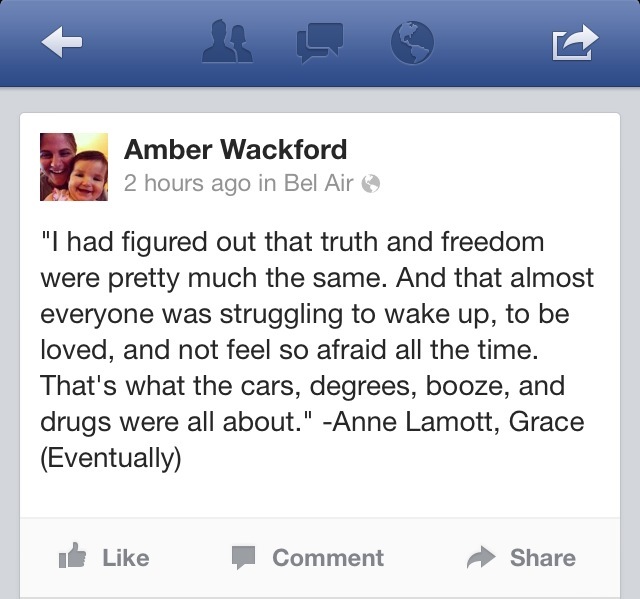 and Amber I was confused about grace for years, unknowingly, and my concept of god was way out of whack with the Truth. I thought that I had to be nice all the time for good things to happen in my life , and that if I was kind enough to other people, that nothing bad would EVER happen to me. Then I read a book on Grace….actually, I have only ever read the 1st chapter because it was so mind altering that I just didn’t need to read any more of it. It’s called the Ragamuffin Gospel by Brennan Mannning. Since reading that chapter, I have decided that Grace is a state of mind. That Grace is available to each of us within every breath and at every moment. It is as available to me as to the person in prison who has committed murder. If I am open to receiving Grace, there is always an abundance. Yesterday I said to my friend ” When I really trust god, doors open.” She replied ” I think the doors are always open, but when we trust god, we can see them “.